Don’t expect bold performance from dis-empowered people. You drain, discourage, and demotivate, if your goal is conformity. Frustration. Anger permeates life when people feel powerless. Blame. Powerless people use “they” more than “I”. Paranoia. People believe you’re out to get them when you make them feel powerless. Anxiety. Incompetent leaders use anxiety as motivation. Helpless. Incompetent leaders make people feel they have no voice. Exclude, don’t include. Keep decision-making processes narrow and small. Elitism makes you feel powerful and others feel like outsiders. Make people feel they don’t matter. Minimize or ignore experience, expertise, and talent on the team. After all, you know and understand more than anyone else. Act busy. We all know busy and important are the same thing. Never walk around the office. Avoid front-line people at all costs. Treat people like ignorant tools. Create policies without collaborating with them. Powerful isn’t egotistically making everyone conform to your wishes. Set limitations that keep teammates focused on what matters. Feeling powerful is about doing meaningful work. Create four viable options with others, but delegate final decisions to others. Choice feels like control. Control is power. Have candid conversations before making decisions. Seek and give feedback on behaviors and results. Reject the need to be liked. Embrace thee need to have influence and impact. Leaders who need to be liked cause instability by making exceptions. 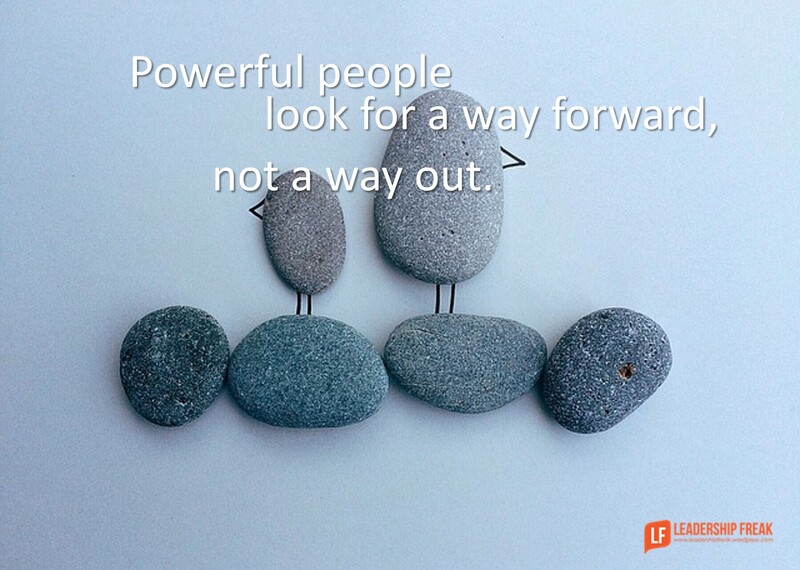 Powerful people look for a way forward, not a way out. How do leaders dis-empower others? I can totally relate to this one from past experience with my own “leaders”. You can add disrespect as another negative result; the people who you are leading can spot a fake with a big ego from a mile away! Thanks Maggie. Feeling disrespected is like a punch in the gut. Great add. Thanks Don. The trouble is they still hold positions of leadership. The other side of this is we all have areas of incompetence. How we deal with it is what matters. There is a difference between the need to be liked, which comes out of insecurity, and being open and secure enough to be liked, which comes from knowing who you are, strengths and weaknesses. You can have influence, be respected and be liked. Some of the best role models I’ve had in my career had all three. Yep… Avoidance, secrecy, control, elitism, and defensiveness are classic behaviors of inexperienced, incompetent, inept leaders. Thanks Brian. It looks like this is your first comment. I appreciate you jumping in. Leaders who aren’t afraid to admit they aren’t perfect themselves, who are authentic and genuine empower others. Real leaders understand they don’t have to have all the answers and in fact, ask your team. The people who do the work usually have ideas. Ask them. That empowers people. Thanks Kari. It’s deceptively simple. If you want people to feel empowered invite their input. Thanks for jumping in. There’s a Sixth way that incompetent leaders dis-empower people: They don’t enforce values and standards, and they don’t discipline those who violate them. Nothing is more demoralizing to a workforce than to see a few folks consistently get away with violating the company’s stated values and standards. When leaders turn a blind eye to these infractions, it puts the lie to those values. I see this quite a bit in the retail and service sectors, where good front line employees are hard to find. Desperate managers will overlook dishonesty, lack of initiative, and negativity toward their customers. Granted, every organization will pick the occasional bad apple. But when these kinds of behaviors come to characterize a company in the customer’s eye – the problem is bigger than the occasional bad apple. The problem with those who are picking, packing and shipping the apples! Thanks Bud. Thanks for coming at this topic from a “whose on the bus” orientation. Very helpful approach. You nailed an important issue connected to turning a blind eye toward people who deliver results. It demoralizes everyone who is playing by the rules. Why bother? I’m a firm believer that leaders should be aligning their teams to the cause or the value that they’re working for, rather than trying to align them to themselves. If people believe in their values (and the organization’s values) they’ll utilize their full potential to deliver and with greater motivation. Thanks Paul. It seems that shared values make people/teams feel empowered. Perhaps it’s because we are clear about how we treat each other? Another great post Dan! Unfortunately this “Im great and you are not” behavior is infectious and can lead to a Dilbert-ville cult like culture that is found in many bureaucracies and institutions. Mature organizations become political and empire building leads to a culture of seeking security and maintaining status quo where growth may actually be punished.Smaller growth companies encourage taking risks and seeking opportunity as they are much more purpose driven. Look at where the organization is in it’s life cycle. If its young it may be much more purpose driven. If it’s an older institution, you’ll find more entrenched politics. Each has a distinct culture, but I believe a truly savvy leader will have the acumen to manage effectively in both environments, which can only come from experience. Thanks Carol. It seems that large companies could learn a lesson or two from small. What a great idea. Wow. My last boss was your definition of incompetent leader, which is exactly why I left that job and looked for competency. Dis-empower: By threatening anyone who threatens the leader’s self worth. Dan, good post. I would love to see a post about leading when you’re not the “official” leader; not just with respect to leading teammates, but also with respect to the team leader. Is there a way for a team member to guide a manager into being a better leader? There is a need for cooperation and respect, but there also a point where decisions need to be made, even if that decision is not necessarily popular. A leader needs to exercise his knowledge and experience. There is a chain of command…it needs to be followed, sometimes at the expense of those who who “follow”. Inexperience sometimes is defined as immaturity.